There are two kinds, Pressure Sensitive and Capacitance ones. Pressure Sensitive is less sensitive, but simpler to make and understand. It has a bunch of wires that have current going through them sandwiched between 2 plastic sheets. The wires form a grid with some current wires going up/down and others left/right, like on a chess board. When you press at a point, such as using a stylus pen, it breaks the current of one of the wires and a sensor can tell where it happened by looking at the X and Y coordinates. The next kinds is more complicated and is what most modern touch screens use, but the concept is similar. They use capacitance and not pressure. It too has a grid of wires, but instead of sensing breaks in current when pressed at a point, it measures voltage changes. Your fingers can conduct charge and is the reason you sometimes get a shock when you drag your feet on the floor and touch something. The voltage changes when your finger is near the electric wires since your finger starts to conduct some of the charge. It is a very tiny charge, so you don't feel it. Sensors at each of the four corners of the touch screen are used to determine the location and even what type of touch it was, like a swipe, or hard press. 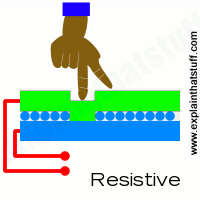 When you touch a touch screen, the computer performs a command based on how and where you touched the screen. Touch screens work by using anything with a electric charge to create the touch screen experience or they use the pressure of your finger to make the touchscreen experience better. Why does my brother in 5th grade always I have a crush on every boy in my class? Why does my brother in 5th grade always think I have a crush on every boy in my class? I Need Help! What's a Quick Way to Get More Storage Space on My iPad? I know a way we can all stay in touch!! I need help for my filmmaking class. How do you change the background of your computer? What kind of computer is the most popular? whats 292 times 457. please help need to turn in some due homework. Can you explain how to make an equivalent fraction? I can't wait for Just Dance 2017 to come up!!!! I lost the password to danger over the walls HELP!!!!!!! Help I need to know if this boy likes me! !